Southsea is filled to the brim with coffee shops. There’s at least twenty on Albert Road alone. Amongst all the delis and bistros is Home Coffee, a special little place that, in the past few days, has won over my heart. Tucked in next to the King’s Theatre, they serve specialist coffees from Rwanda and Panama as well as their own signature blend. Outside you will always find a chalkboard cracking a joke to make you smile. This time was a Lord of the Rings themed one – ‘Bilbo was surprised to wake one morning and find a Tescos had been built next to his house. It was an unexpected item in the Baggins area.’ I shook my head the way everyone does at bad jokes and puns and headed inside with a little smirk playing on my lips. It’s small inside the first Home Coffee, with the other being in Cosham, but it’s cosy and intimate as the name would suggest. The tables are wooden, sanded down for that rustic effect, and the walls are lined with pristine white tiles. 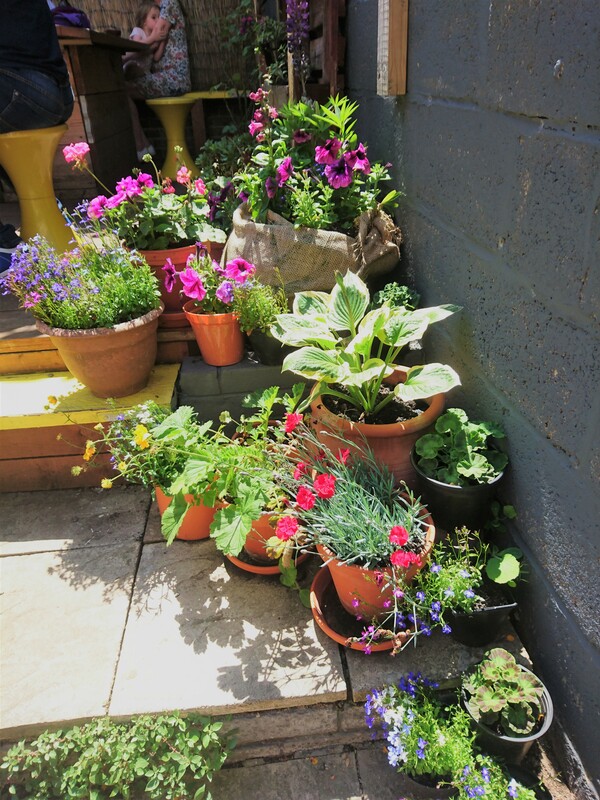 They also have a few plants and succulents dotted here and there to add to the airy, fresh feel of the place. I was greeted straight away by a beaming member of staff, asking me how my day has been and what I would like. I stared at their small array of cakes. They were mainly brownies and sponges, all homemade, with some interesting flavours like Rhubarb and Orange. I dibbed one of the brownies and ordered a tea and some water. So I did. At the front, by the door, were towers of clean glasses and repurposed wine bottles filled with cold water. I grabbed the fullest one and took a seat in their hidden garden. In weather like this, it is beautiful. Out the back, there are small wooden steps that take you to this outside haven full of flourishing flowers from petunias to morning glories. It’s packed away perfectly between the shops and flats and when my tea and brownie was bought out for me, I sat there in the sun, calm and relaxed. You can’t really hear the cars or the noisy street feet away. You can just unwind and that is the best thing about Home Coffee. “Anything else at all?” The waitress asked me to which I asked for the menu. She bought that out minutes later. The menu is a decent size with some interesting flavours and lots of vegan/vegetarian/gluten-free options. For food, there’s mainly salads and sandwiches with the occasional platter and ploughman. There’s lots of sides and fillings to choose from as well as vegan alternatives for cheese and butter. They use local produce from places such as Bread Addiction as well as creating their own chutney, piccalilli and pink lemonade. Their smoothies are pretty impressive, bursting with healthy ingredients from coconut, honey, spinach to pineapple. Helpful enough they even listed what vitamins are in them and what each one helps with. 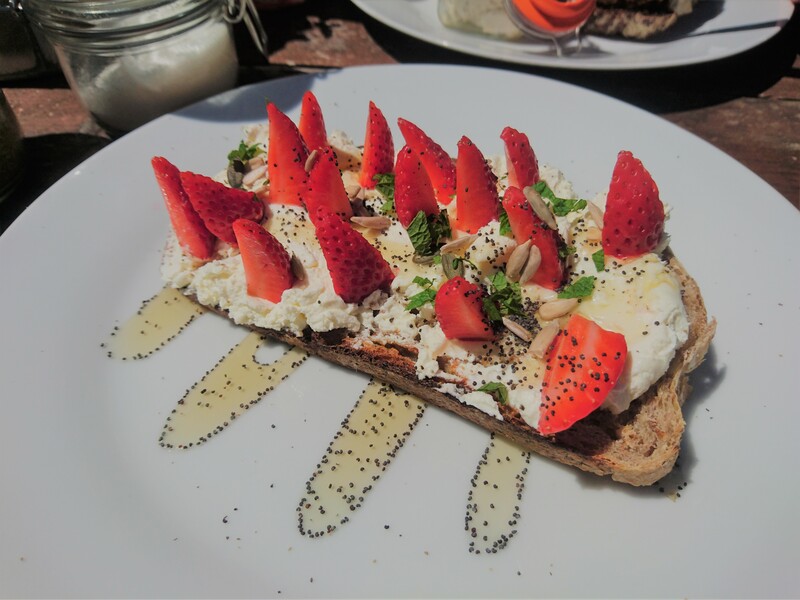 Something caught my eye on the menu however, something very different – strawberry and feta crostini. Now that is something you don’t see on a menu every day. Normally I don’t try new things but today I wanted to surprise myself so I ordered it along with a pink lemonade and the ploughman’s. To keep me occupied until then, I devoured the brownie which was gorgeous; gooey on the inside and crispy on the outside. It wasn’t too sickly so I managed to eat it all, just in time for my feast. The crostini was two thin slices of sourdough with creamy feta on top, drizzled with honey. The strawberries were sliced into small pieces and layered delicately and precisely on top. It was a work of art but did it taste like it? The bread was a little hard but the feta was sweet and the best companion with the strawberries. The honey made it that much moreish too. 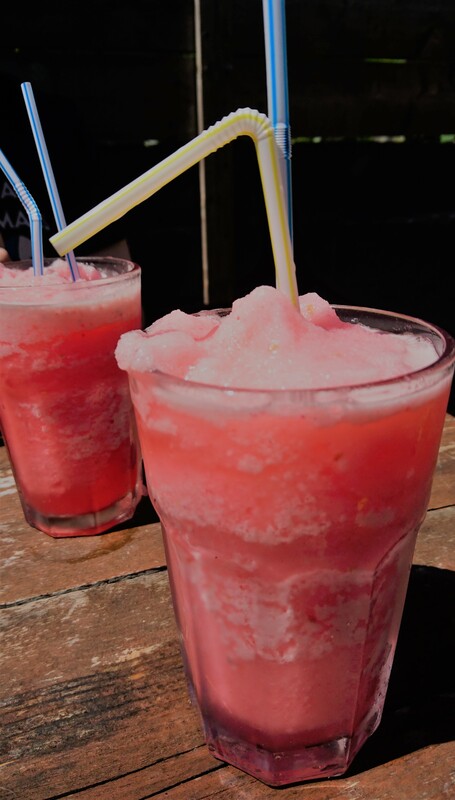 Each bite was like sampling the best bits of summer – sugar, strawberries and sun. I never thought they would all go so well together but I was shocked and licked up every crumb. I even went back the next day for another. Now to answer my earlier question, oh yes it did! 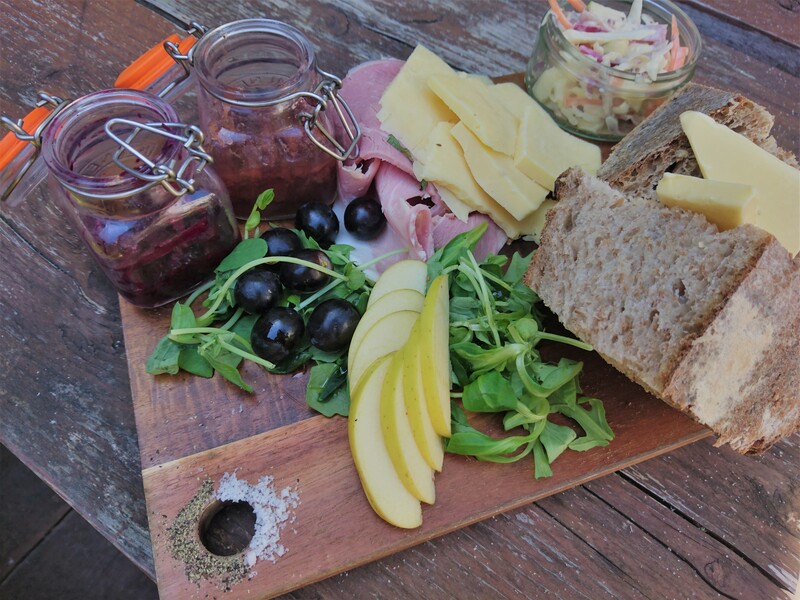 The ploughman’s had great presentation with folded ham, slices of cheese, small jars of beetroot and apple chutney, a pot of coleslaw and two chunks of fluffy brown bread. It was carried out to me on a large chopping board and in the corner, I noticed a neat line of pepper and salt. This was also brilliant. The homemade chutney was sweet and tangy and it was splendid eaten with the fluffy bread and cheese. There were thick slabs of ready to melt butter and the meat was tender and rich. It definitely beats the awful Tesco brand ham in my fridge. The cheese was also nice but not as crumbly as the menu suggested but I partially blame the heat which makes all cheese go a bit greasy. The coleslaw was also nice and very tangy but maybe had a bit too much onion. Either way, I thoroughly enjoyed that, the most impressive ploughman’s I have had. The price of it all was really good, especially for the quality. Home Coffee is a magical place with a menu exploding with flavour and a garden alive with colour. It is the perfect place to go to and relax, drink some specialist coffee (if you’re into that) and try the beautiful food that caters to everyone. Even though it may be placed in a city saturated with coffee shops, it has certainly caught my attention. After all, you may go to a hundred places but they will never be quite like Home.